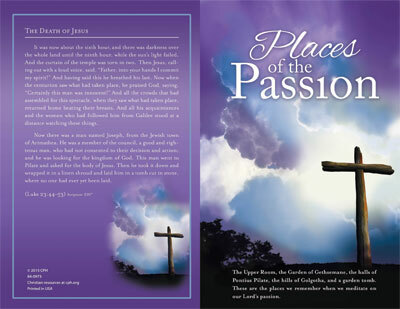 This standard 8.5" × 11" bulletin features a full-color visual on the front and Luke 23:44–53 on the back. The inside is blank to provide space for personalization. Sold in packages of 100. The Upper Room, the Garden of Gethsemane, the halls of Pontius Pilate, the hills of Golgotha, and a garden tomb. These are the places we remember when we meditate on our Lord’s Passion. Now there was a man named Joseph, from the Jewish town of Arimathea. He was a member of the council, a good and righteous man, who had not consented to their decision and action; and he was looking for the kingdom of God. This man went to Pilate and asked for the body of Jesus. Then he took it down and wrapped it in a linen shroud and laid Him in a tomb cut in stone, where no one had ever yet been laid. The scenes of Lent are familiar. The upper room, the garden of Gethsemane, the halls of Pontius Pilate, and the hills of Golgatha, these are the places we remember when we meditate on our Lord’s passion. Yet when Jesus enters a place, he never leaves it as he found it. The most troubling places of our lives become the most amazing places of God’s grace when Jesus visits them. For this reason, in this midweek Lenten series, we will revisit the Places of the Passion. Our focus will not be on the physical locations of our Lord’s passion but on the spiritual wonders of his work: the places where he demonstrates his strength in the midst of our weakness, his timeless love in the midst of our temporal darkness.